I would change "English Major . . .' to just 'Reading books. . .' Love the books on this picture, too! I've read four out of the six. Trish, I've read 3 of the 6. 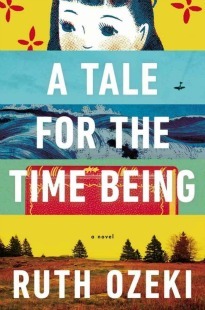 I know, I saw this and absolutely loved it!I've read out of six too. LOVE this, though I'd agree with Trish -- sadly, I wasn't an English major. I wonder if I'd have had better grades in college if I had been. . . . 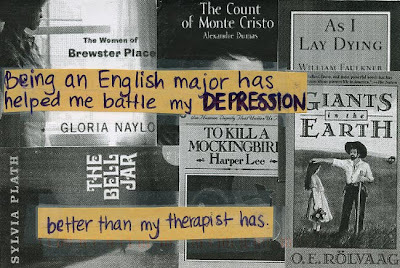 But I have to wonder if reading "The Bell Jar" and "As I Lay Dying" are a good idea if you're in therapy!!! Both of those were pretty depressing. And I'm really happy to see "Giants of the Earth," which has been on my TBR shelf for about 10 years. Still haven't read it. But obviously someone has! Karen, Good point. I haven't read As I Lay Dying, but The Bell Jar was certainly a downer. Oh what a fantastic PostSecret! I have to agree with Karen about The Bell Jar and As I Lay Dying...those were pretty depressing...although it could help someone see that their life isn't as bad as someone elses....thanks for sharing this one!